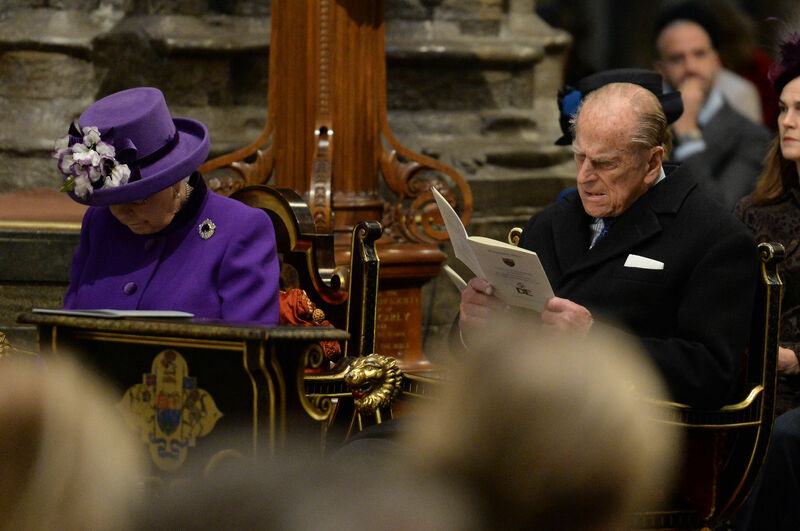 The Queen, The Duke of Edinburgh, The Earl and Countess of Wessex, have attended a Service of Thanksgiving at Westminster Abbey to celebrate the Diamond Anniversary of The Duke of Edinburgh's Award (DofE). The DofE was founded 60 years ago by The Duke of Edinburgh at the request of his former headmaster, Kurt Hahn, who thought that each of us has more courage, strength and compassion than we would ever believe. It is now widely recognised as the world's leading achievement award for young people and has helped to transform the lives of millions of people around the world. In a foreword for the Service, The Duke of Edinburgh said: "The growth of the scheme owes everything to the untold numbers of volunteers who have given their time and enthusiasm to bring its benefits to a constantly growing number of young people all over the world." During the service, held on 24 November 2016, The Earl of Wessex gave an address in which he told inspirational stories about winners and participants of the scheme. "None of the stories I've told are unfamiliar to our Founder and Patron, however, as probably the most self-effacing and modest person I know, you would never dream of taking the slightest credit for any one of them," His Royal Highness said. "Yet they all know, whether they come from a traveller's community, a Jewish community, a Muslim community, a Maori community, a Kenyan slum, South African prison, Ghanaian hospital, Ireland, Scotland, Wales or England that this Award bears your name, that you started it and you did it because you have faith in people. Your own concern for the welfare of young people and desire to encourage their development, your experience of Kurt Hahn's philosophy and approach coupled with the skills of Lord Hunt and others you engaged at the beginning has helped to empower millions of participants, parents, teachers, voluntary organisation leaders, employers, DofE leaders and mentors. "The few who are gathered here today in this magnificent Abbey represent the millions who want to say thank you; thank you for believing in us, encouraging us and giving us the chance to savour that sense of satisfaction though achievement." 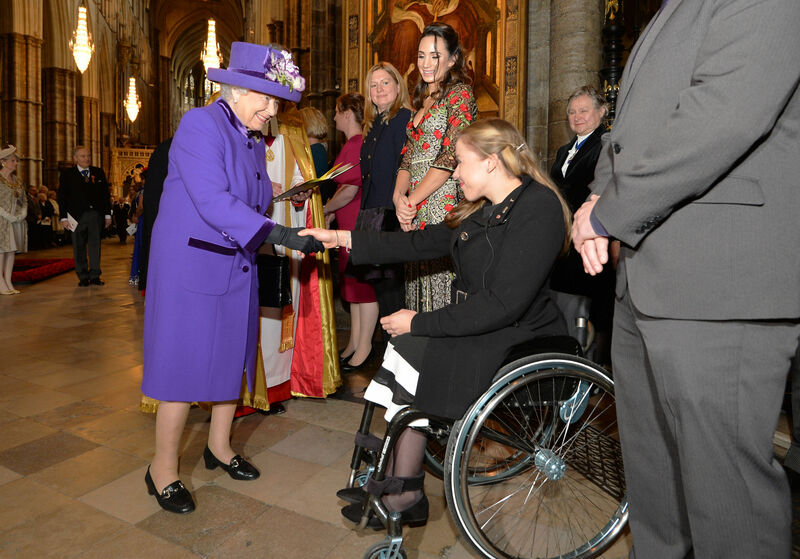 There were more than 2,000 people in attendance at the service including DofE Award holders Paralympic Gold Medallist Hannah Cockroft MBE and soprano Laura Wright. DofE Ambassador Jon Culshaw gave a reading and broadcaster Phillip Schofield read out a prayer. 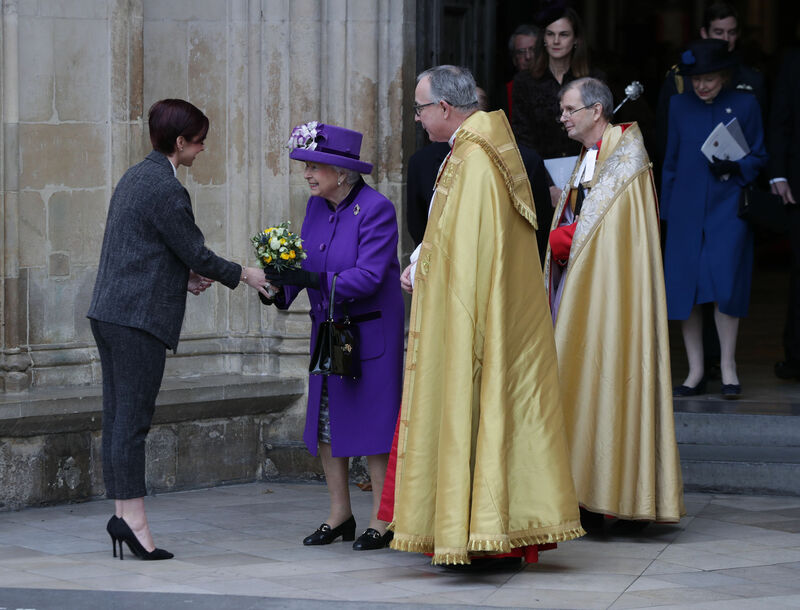 At the end of the service The Queen was handed a posy by DofE award holder. The Award operates in more than 140 countries and in its 60 years of running has inspired millions of young people to serve their communities, experience adventure and develop and learn outside of the classroom. The four key elements of the Award are service, skills, physical recreation and adventurous journey, and is open to those between 14 and 24 years of age. In its Diamond Anniversary year it has outlined its vision for the future - to transform two million more young lives by 2020. Find out more about the DofE and how you can get involved in the Diamond Challenge.